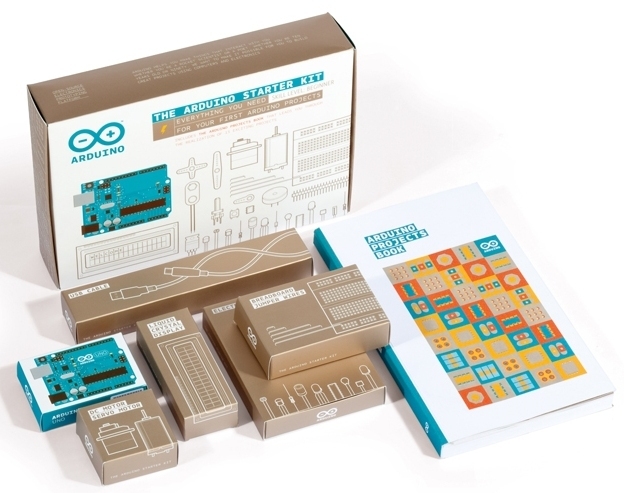 The Arduino Starter Kit provides you with an easy entry into the fascinating world of electonics and programming. It is intended for the novice but holds tricks for the more advanced. The kit comes with a detailed and easy to read projects book. First, an internet connection is required to download the latest version of the Arduino IDE, about 100 MB to start. Then the projects book will guide you through the setup on the PC. Five minutes later an experiment starting with a simple blinking light can begin. All the parts to do the experiments described in the book are included, even a USB cable for the PC connection. The book starts with LEDs and develops to more complex projects including various sensors, a servo and a DC motor while the user is learning to program. The programming language is a simplified C for the Arduino platform. A clear explanation gives background information on every step, so it is easy to follow and you are learning by doing. Motivation is the key intention of the kit, and it is doing a good job. Arduino is an open-source electronics prototyping platform, it is used by many designers around the world to create innovative projects. A large internet community is there to share ideas. No limits for imagination and new crative projects.